Take one look at the area around The Shores [map] development using Google Maps and you’ll find more parks than you can wrap your head around. The waterfront neighbourhood on the western edge of Oakville, where Cityzen Development Group chose to build the ten story luxury condo and townhouse complex, is literally brimming with green space. Take it from a seasoned city slicker, finding such a concentration of parks, playgrounds and waterfront bike paths in an urban area is a rarity. It’s certainly tempting to flee Toronto’s crowded parks and waterfront trails to explore Bronte Heritage Waterfront Park, Donovan Bailey Park, Riverview Park… The list is goes on. And I haven’t even mentioned the massive provincial park that’s only a 1o minute drive north of The Shores. The Bronte Creek Provincial Park accommodates basically any outdoor activity you can name. There’s plenty of hiking and biking trails and more than enough space to pitch a tent and camp out overnight. There’s swimming in the summer and skating when the temperature dips below zero. The park’s large fields and scenic trails are also perfect for cross-country skiing. Well, what about cliff diving and spelunking? Okay, almost any outdoor activity you can name. All the kids might be going to the Jersey Shore to party on the beach, but those who are really in the know are claiming an idyllic piece of waterfront real estate in The Shores for an amazing view of Lake Ontario and enough green space to share. 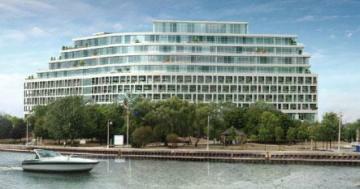 Prices for The Shores condos and townhouses range from $329,900 to $2,249,900. For more information on the development phone the sales centre at 905-815-0009 or email info@cityzen.ca. Presentation centre hours are Monday to Thursday between 12pm and 6pm and Saturday and Sunday between 12pm and 5pm. The centre is closed on Friday.